I have a 1996 Kawasaki bayou 300 2x4 it starts right up Everytime but dies as soon as you let off the starter button if you hold the button it will stay running but don't want to burn starter up please help.. i have put a new battery in, new coil, new plug, replaced cdi, ignition switch, check and cleaned all connections and grounds.. I will check when i get home mine looked a little different then that i dont thank mine had a fuse in it but the main fuse off the battery is good.. Thanks will update later.. I found the wiring diagram for your Kawasaki online . The ignition switch works through the starter relay, so as quadmaniac says, it is most likely a faulty starter relay.. As long as you hold the starter button you are getting ignition power as well as starter run but releasing the button does not allow power to continue going to the ignition circuit. Thanks alot guys i really appreciate the help i will order one tonight and go from there will update one way or the other.. So i got the starter relay today i put it on and still when you let off the starter button its like your hitting a kill switch.. Check the engine stop switch to see if it is stuck on, and also trace the wires. We may have misled you on the relay.. There are two of them. One is the starter circuit relay and the other is the starter relay itself.. 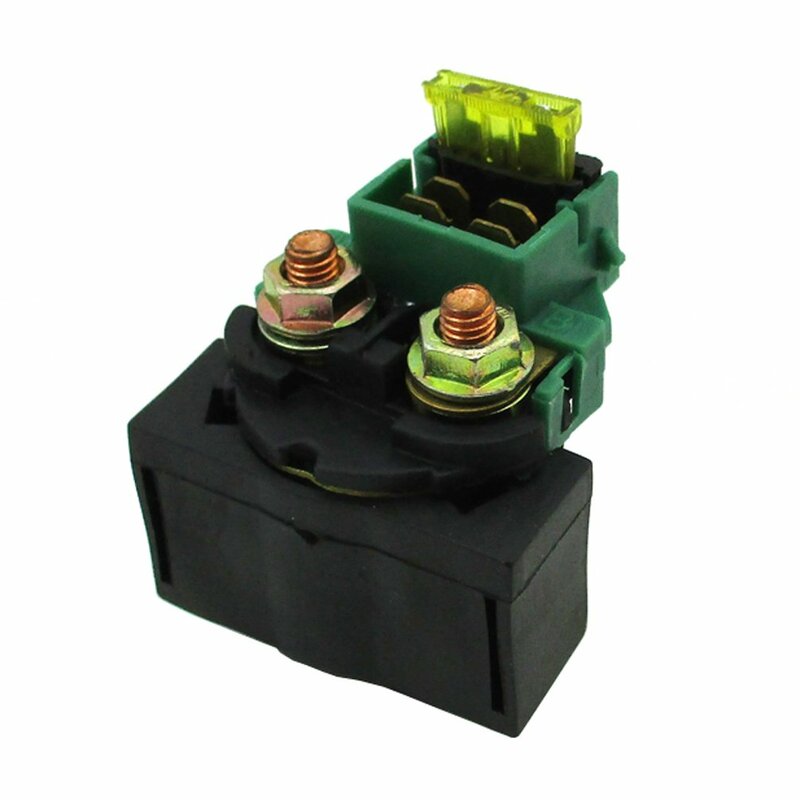 If it is the relay , it will be the starter circuit relay. If that is the one you replaced, check the engine stop switch. According to the schematic it should be open when the engine is running. Closing it opens the ignition circuit and kills the engine. Holding in the start button feeds power to the ignition circuit until you release the button. After installing the new relay i thought maybe the switch so i bypassed the engin kill switch and starter button with jumper wires and a push button at the main harness plug where the kill/starter switch plugs into the main harness and it still does the same thing guess i will order the other relay and try that.. The kill switch should be open, not jumpered. .Disconnect the kill switch and do not join the wires together (no connection between wires or contacts, "open", connection between wires "closed") . The kill switch needs to be open for the motor to run. I will try that and see what happens next thanks alot..
My only remaining guess is the starter circuit relay. If that isn't it, I'm beat. After you mentioned that disconnecting the kill switch nothing worked, I went back to the wiring diagram again. It doesn't show the configuration in the run state, so I can't guess what is open and closed. Obviously from what you said , the kill switch must be closed rather than open as I thought. I see the starter switch also connects to the igniter ( CDI box). If the starter circuit relay isn't the culprit, that would only leave the CDI box , and that is an expensive box to replace. It looks like it may be time to bite the bullet and see a Kawasaki mechanic . I've exhausted my guesses and without being able to physically get to it with a meter and service manual , I'm beat. Well thanks for your help i will post back if i figire something out. If your start button wiring is shorted you are hitting a kill button. Disconnect the starter button from the harness and jump across the solenoid with a screwdriver and if the bike starts and then dies after removing the screwdriver then it's not the starter button, but i'm betting it is.